Mercedes offers European buyers a special-edition C-Class sedan, wagon and coupe to keep it fresh until its replacement comes along. With the E-Class above it having just been refreshed and the new CLA slotting below it, the Mercedes C-Class is starting to look a little long in the tooth. 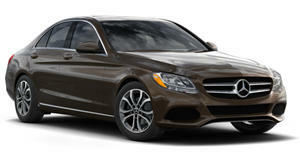 After all, it has been on the market since 2007, making it one of the oldest cars in the Mercedes lineup. Benz is working on a replacement, but to keep it fresh until then, it’s offering a new special edition. Called the Edition C, the special edition includes the sedan, wagon and coupe versions of what used to be known as the Baby Benz before the A-, B- and CLA-Classes came along. The special edition includes a new grille with glossy black louvers and chrome trim, darkened headlamps, AMG front and rear aprons and side sills, chrome tailpipes and special badging. 17-inch, five-spoke alloys sit at all corners, and the interior is upgraded with sports seats with two-tone contrasting stitching, dark aluminum trim, a sports steering wheel and shifter and microfiber upholstery.